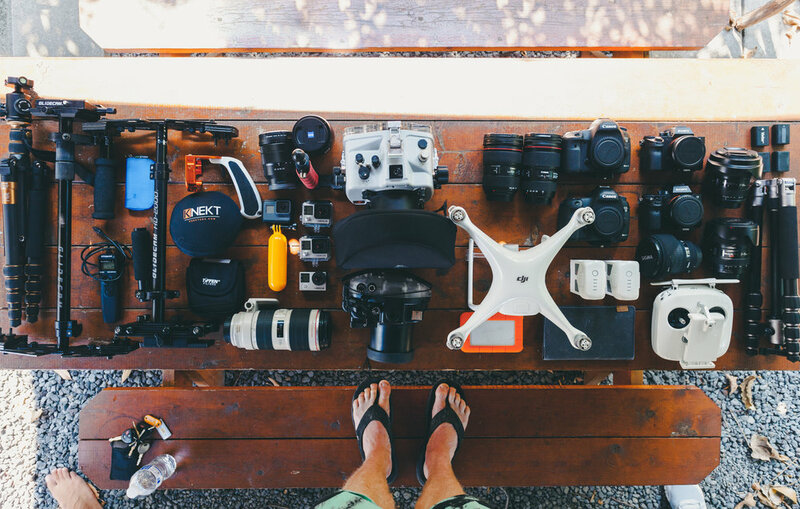 Gear Flat Lay from my recent trip to Hawaii! On my most recent adventure to Hawaii I took with me the largest amount of gear I've ever taken on a trip! My buddy and I were running all around the island with just a massive amount of gear! We got to talking and joking about how much stuff we had with us, and that we should take a cool flat lay picture, because I guarantee people are going to want to know what we shot everything with. Check out our Hawaii short film here “Playful Heart - Hawaii”. Also, Make sure to check out the comphrehensive list of all the gear we took on our trip! My go-to camera setup when running around the island was the Sonya7sii paired with the metabones canon mount adapter and Canon 16-35mm f4 lens run on top of the Devin Graham edition glide cam. Other notable lenses and setups used were the Canon 24-70mm f2.8 lens and the Canon 70-200mm f2.8 lens. The 24-70mm was mainly used for closeup hand held and detailed shots while the 70-200 was used to capture distant and far away moments like waterfalls, trees, clouds etc. I also heavily used my Sonya7sii paired with the Sony/Zeiss 16-35mm f4 lens in my new Ikelite 8inch dome port underwater housing. Most all underwater shots were shot using this combination of camera, lens, and housing. What's In My Camera/Travel Bag!? Recently I took a trip to Hawaii to get away, relax, and exercise my adventurous spirit. As usual, I had a camera strapped to my hands at all times, and created an epic recap video of my trip and adventures on Oahu, Hawaii. Check it out below. I’ve always loved traveling and adventuring, but something was different about this trip. I never wanted to leave, who wouldn’t, but I had viciously been bitten by the travel/adventure bug! I now have this burning desire unlike before, to just travel, explore, live life and make videos and document it all! I've had a lot of questions about the type of gear I use and take on a trip like this. I wanted to create a quick video outlining all the gear I pack into my camera bag to take with me on these trips. So enjoy the video of me showing off all the various types of photo/video gear I take with me to create some epic travel visuals. You can find an extensive list of links to all of the pieces of gear below the video!